New York is a melting pot of different cultures and traditions, formed over decades of people from all over the world converging in the state of New York and branching out to different boroughs and establishing their culture wherever they decided to plant their roots in the state. One of the prominent communities in New York City is the Jewish community, which is why you can see a lot of kosher restaurants dotting the entire city and the state. You can enjoy this dish at one of the best kosher restaurants in Manhattan. Fried chickpea balls, herbs such as coriander, parsley and cumin and other seasonings make up falafel. Israeli salad usually accompanies this dish served in warm pita bread. It is a Jewish meal staple. Shakshouka is an egg dish. 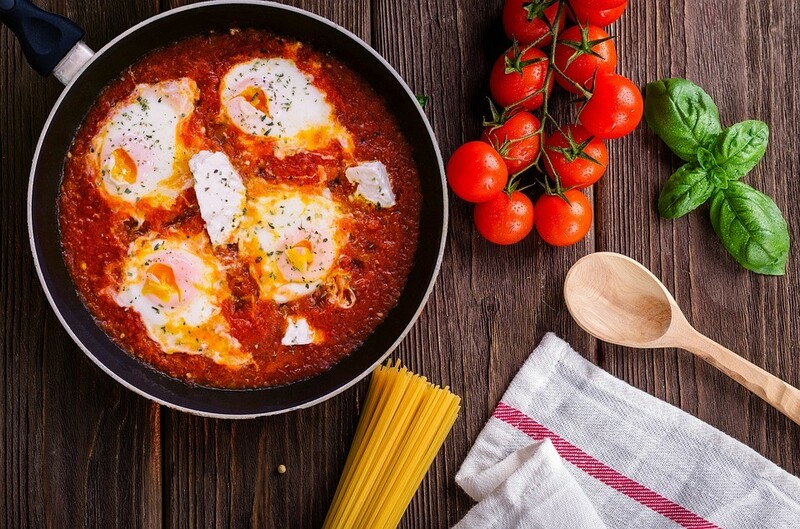 Poached eggs mixed with seasoned tomato sauce make up this delicious dish. Pita bread usually comes with it, which is also very filling. Challah is essentially an egg bread. You will see that the outside is golden and crispy, but once you take a bite, you will see that the inside is moist and soft. The main characteristic of challah is its braided surface. It is a very filling food and will get you through the next meal. This dish uses chicken soup for the matzoh balls to swim in. Schmaltz, or chicken fat, is a staple ingredient used in making the balls. Matzoh meal and other ingredients such as eggs and club soda complete this carbohydrate-rich dish. The soup also consists of carrots and herbs seasoned with kosher salt and pepper. Potato is the main ingredient of kugel. It is basically like a baked tater tot. Sweet potatoes are also used to substitute regular potatoes for those who like the sweeter version. This dish is always present in Jewish holidays, but with the presence of kosher restaurants, you can have it anytime you fancy. Deep fried potatoes that look like pancakes are another Jewish meal staple. Applesauce or sour cream is the perfect partner to dip these latkes on. This dish is effortless to do at home and only requires several ingredients and lots of oil. Borekas is a famous Israeli street food. It is crusty and crusty and usually filled with spinach, cheese or potato for added flavor. For the more adventurous eaters, they can try the ones with lentil and onion stuffing. Served alongside falafel, this refreshing and healthy Israeli salad consists of cucumber, tomatoes, parsley, mint leaves, ground black pepper all mixed and drenched in lemon juice and olive oil. This no-cook salad is easy to prepare. Once you try a kosher food, there’s no going back. It is rich in flavor and strictly adhere to kashrut laws, which are the dietary rules that the Jewish follow. Even if you are non-Jewish, you will learn to love the richness of their traditional food that is not only for their exclusive enjoyment but also for those outside of the Jewish community who like to have a taste of Israeli heritage.